I was initially thinking these have got to be placeholder art images, but it looks like they’re not. Hoping the 4K release of Jurassic Park next year, first of all, happens, and secondly, features better, premium art. uhh… if the stegosaurus was redesigned… AT LEAST USE THE DESIGN FROM THAT MOVIE!!! 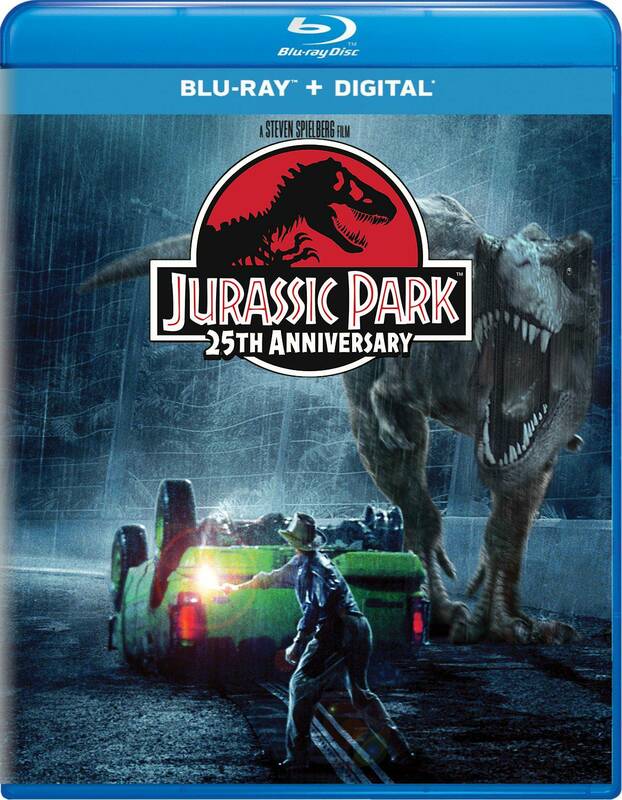 The comic-style Blu-Ray steelbook cover is the best cover of any Jurassic Park media release, second only to the original logo/all-black background of the VHS. Shame it wasn’t included here as it sets the bar pretty high. Thank you for pointing out Universal’s lack of brand uniformity for this franchise. Whoever is managing the overall look of this brand is not doing his or her job. Gotta call out that the rex head on the JP cover is def not the JW Rex head. Its most definitely the Male Rex from TLW. While it’s not an exact match, it does seem to be the base image used to create the JW 2015 Rex head key art. It’s an awkward angle and look either way. Pathetic and using a deleted scene (TLW) as an artcover and then not offering any of them on the bonus section. Boo on you Universal! I know these are just Blu-Rays to movies that are already released on that form of media. But you would think for the 25th anniversary to a 90s classic that made dinosaurs become mainstream would be treated with the utmost respect and not just cobbled together with a poor photoshop job. Like the article states, these new covers look more like monster B-movies than Jurassic Park. Because of this I am now nervous to see what Universal will treat the new film like. These covers try to make Jurassic Park look like some monster/disaster films, when they’re not. The same problem occurred with Jurassic World. I just hope Universal doesn’t try to taint the reputation of the franchise. This may just be me over analyzing poor Blu-Ray covers, but if this is how the franchise is going to be treated, then I don’t like the new direction. Do not kill me…but they look alright to me. The thumb on the T.Rex is bad, yes but…they look okay…do not kill me pls. The concept isn’t bad, but if they’re going this route, they should have someone just draw some ‘concept’ art of the scenes they’re using, and have it as a wraparound style, like some PS4 reverse-insert art.. That way it doesn’t look terribly photoshopped, and they can just say that the covers are artistic interpretations of those scenes. Would look way cooler than this. Come on Universal, take some time and pride it this franchise, it could become huge(r) with the right stuff! I just want a 4k release of all of the films, too much to ask? I really want a 4k release! There is no reason for them to release another Blu-ray version of the trilogy. Can’t help but note the Jurassic Park III logo is new too- it *isn’t* the Spinosauraus! Yeesh! It’s…okay, at best. I, for one, prefer the original JP3 logo over this new one. I can forgive the colouring in book cover, it looks like it’s for kids, but the whole series is kind of targeted towards kids and young teens, but the bluray covers look like cheap $2 store knock offs. I wouldn’t expect anything less from Universal though. Ok,I’m taking a risk here,but please hear me out.when I look at this cover art, I got a different message. Perhaps it’s due to my age or preferences throughout my life,but what I see is paperback artwork from the 70’s or earlier(and yes, I’m aware that dino’s looked different back then,that’s not my point).My immediate impression was how much they looked like covers to the Hardy Boys mystery books or Classic Comics by Whitman(or Gold Key? ).Perhaps the artists were going for that look.I’m not arguing that this is above scrutiny, or up to todays standards,but perhaps an explanation by the artists is in order. 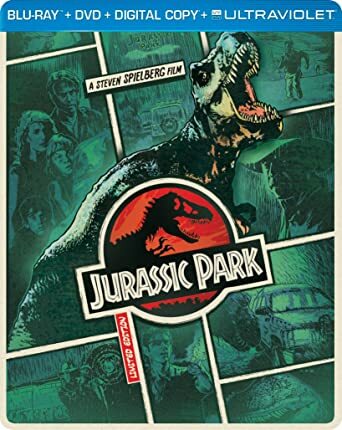 I once saw a steelbook edition of the first Jurassic Park at walmart with some amazing 1960s style film poster artwork. If I find it, I will post a link here! Is anyone going to notice that Nick’s whole body is just hidden behind Ian in the Lost World cover art? Nothing about these is good. These covers don’t even acknowledge the 25th anniversary, do they? There has to be someone we could talk to at Universal to submit better ideas for these covers. I’ve said it before, recently. I think the best thing we fans can do for these BluRays is to NOT buy them. As for any possible 4K release of all the films, I hope a 5 disc set will be available by the time Fallen Kingdom is released. Or near Christmas time. I really doubt it. These crappy covers are probably all we’re getting. The 25th anniversary is not about the movies, its about how much unneeded merch they can slap that 25th Anniversary logo on. Anyone seen any plastic lunch boxes yet? It’s actually a little better. If they’re gonna make a joke out of the series at least go all the way like you have done here. The toilet paper is a nice touch. Yeah…I think I’m good with my JP 4 movie blu ray collection. It’s simple and has movie stills as the slits for the discs, representing some of the memorable scenes from each film. Just the way these new covers were edited is uneasy to the eyes. Home media covers should be able to win me over again for that particular movie after having watched in the theaters. For JP, it would be the menacing jaws of the rex. For something like The Hunger Games, it would be Katniss with the fiery mockingjay behind her and when its a MCU movie, something that captivates the energy of the film, such as the latest Captain America confronting Iron Man. With how JP is being treated for re-releases, its underwhelming and disappointing. I even personally think that the blu ray cover of JW should have been more than just the velociraptors and Chris Pratt. They need to go back to the original theatrical logos, none of this weird tall W in The Lost World or the yellow JP3. And man I wish they moved away from the grey and the smoke for Fallen Kingdom, it’s textbook gritty reboot stuff, dull. The covers look cool but aren’t really accurately depicted for Jurassic Park. I think that JP25 would get its own release each month with new content like behind the scenes. Forget quibbling about the covers, did they ever improve the HD transfers? The initial blu ray release is notoriously bad, I can’t believe Spielberg approved it.